Aim: The aim of this study was to compare the antimicrobial efficacy of calcium hypochlorite (Ca(OCl)2) and sodium hypochlorite (NaOCl) associated with or without erbium, chromium: yttrium, scandium, gallium, garnet (Er,Cr: YSGG) laser irradiation in root canals experimentally infected with Enterococcus faecalis. Materials and Methods: The root canals of 105 single-rooted premolars were enlarged up to file 40, autoclaved, inoculated with E. faecalis, and incubated for 21 days. The teeth were randomly divided into seven experimental (n = 15) groups according to the protocol for decontamination: syringe irrigation (SI) with distilled water (DW), SI with 2.5% NaOCl, SI with 2.5% Ca (OCl)2, laser-activated irrigation (LAI) with DW, LAI with 2.5% NaOCl and LAI with 2.5% Ca (OCl)2 and LAI with no solution. Microbiological samples were collected and the colony-forming units were counted before and after irrigation procedures and the percentages of reduction were calculated. Results: Mean numbers of recovered bacteria in the SI with DW group were significantly higher than those in the other experimental groups (P < 0.05). The high bactericidal reduction was observed in any of the other treatment groups: SI using NaOCl or Ca (OCl)2 and LAI with DW, NaOCl, Ca (OCl)2 or no solution, with no statistically significant difference. Conclusion: Er,Cr: YSGG laser with or without an irrirgation solution has antimicrobial effects on dentinal tubules infected with E. faecalis. The antimicrobial property of 2.5% Ca (OCl)2 was effective as 2.5% NaOCl on E. faecalis with conventional or laser activated irrigation in root canals. The success of endodontic treatment depends on complete elimination of microorganisms and their toxic products from the root canal system. Nevertheless, the eradication of all microorganisms from infected root canals is almost impossible due to the complex anatomy of the root canal, especially in the apical thirds. Culture techniques have shown that instrumentation or irrigation of root canal system could not effective in complete elimination of root canal bacteria which indicates that resistant microorganisms have the ability to remain viable in obturated root canals. One of these microorganisms is Enterococcus faecalis, which can withstand harsh environmental conditions and resistance to conventional endodontic procedures. To achieve eradication of this resistant microorganism, several novel techniques, including laser irradiation, have been investigated. Sodium hypochlorite (NaOCl) has traditionally been used as an irrigation solution during mechanical instrumentation due to its antimicrobial efficacy in various concentrations (0.05–6%). It has been demonstrated that syringe irrigation (SI) with high concentrations of NaOCl can achieve equal or greater bacterial reduction than laser-activated irrigation (LAI).,,,, However, NaOCl is highly irritant when in contact with periapical tissues, there have been attempts to identify alternative irrigants with the same efficacy, but less toxicity. Calcium hypochlorite (Ca(OCl)2) is widely used for industrial sterilization, in water purification treatments, and as a bleaching agent. This solution has antibacterial properties , and the ability to promote soft-tissue dissolution at the same level as NaOCl, but it is ineffective in removing the smear layer—which is also true of NaOCl. The antimicrobial potential of Ca(OCl)2 with syringe, sonic and ultrasonic irrigation systems in root canals infected with E. faecalis was investigated in recent studies., However, there is no study in the literature related to antibacterial efficacy of Ca(OCl)2 in conjuction with Er, Cr: YSGG laser irradiation in infected root canals. The aim of this in vitro study was to compare the antimicrobial efficacy of Ca(OCl)2 and NaOCl associated with Er, Cr: YSGG laser irradiation and SI in root canals experimentally infected with E. faecalis. After approval by the University of Cukurova Institutional Review Board, 105 extracted single-rooted premolars with closed apices were analyzed with digital radiographs in the buccal and proximal directions to check for a single canal. The study protocol until classification of treatment groups was the same as our previous study. The teeth were standardized to a length of 14 mm with a diamond bur. The working length (WL) was set at 13 mm, 1 mm short of the anatomical apex. The patency of each canal was established with a size 15 K-file. Size 4 and 3 Gates Glidden Burs (Denstply Maillefer) were used to flare the coronal aspect of each canal, and the root canal preparations were performed with a WaveOne (Dentsply Tulsa Dental Specialties, OK, USA) system #40 file at the WL according to the manufacturer's instructions. During instrumentation, irrigation was performed with 5 mL of 2.5% NaOCl using side-vented needles (0.3 × 25 Endo-Top, PPH Cerkamed, Poland). After instrumentation, the root canals were irrigated with 3 mL of 17% EDTA (Calasept, Nordiska Dental, Sweden) and then filled with 1 mL of 17% EDTA for three minutes to remove the smear layer. Final irrigation was performed with 2 mL of distilled water (DW). The root canals were dried with paper points, composite resin (3M, Saint Paul, MN, USA) was used to seal the apex, and nail polish was applied in two layers around the root surface to prevent bacterial leakage. Each root was fixed with Putty-C Silicone for Impression (Panasil putty soft, Kettenbach LP, USA) in an Eppendorf tube to facilitate handling and identification. The tubes were placed in plastic carrier boxes in autoclave sachets and autoclaved for 30 minutes at 121°C (Hirayama, HV-50L, Japan). Sterilization of the prepared teeth was checked with an indicator (Emulating Indicator, 4A Medical, Ankara, Turkey) placed in the sachets. E. faecalis (ATCC 29212) were obtained from the culture collection at Refik Saydam Hıfzısıhha Institute, Ankara, Turkey. The bacteria had previously been cultured on 5% blood agar (supplemented with 5% sheepblood; bioMerieux, Turkey) plates and cultured in brain-heart infusion broth (BHI; bioMerieux, Turkey). Bacterial strains were confirmed by Gram stain and by colonial and growth characteristics. E. faecalis colonies were harvested from the blood agar and suspended in 4 mL of phosphate-saline buffer (PBS). The microorganism suspension was diluted with sterile PBS to achieve a concentration of 108 colony forming units (CFU)/mL using McFarland standard tubes. Then 105 sterilized root canals were opened under a laminar flow hood (Hera safe, Thermo Scientific, Germany) and filled with 20 μl of E. faecalis suspension using sterile automatic micropipettes (Pipetman Neo, Gilson, France). Sterilized 15 size K-files were used to carry the bacterial suspension to the WL. All specimens were incubated at 37°C for 21 days, and the root canal contents were replaced with fresh and sterile BHI every 48 hours. At seven-day intervals, sampling was performed from five randomly selected teeth were tested for bacterial contamination. After the incubation period, initial samples were collected with three sterilized paper points of size 35. Each paper point remained in the canal for one minute. The absorbent paper points were transferred to a tube containing 2 mL sterile PBS and vortexed for 30 seconds. The sample was diluted to 10−4 in PBS, and 0.1 mL of the 10−4 dilution was plated on blood agar. The plates were then incubated at 37 °C for 24–48 hours. The bacterial count was measured in CFU/mL and was performed using an IUL colony counter (IUL, S. A, Barcelona, Spain). The Ca(OCl)2 solution was made from granules (Jianghan Salt and Chemical Complex, Qianjiang, Hubei, China) at the time of the experiment. The desired concentration of 2.5% Ca(OCl)2 solution was prepared using sterilized DW (weight/volume ratio) and mixed with a magnetic stirrer for 30 minutes. The NaOCl solution (Chlorax D, PPH, Cerkamed, Poland) was prepared at 2.5% concentration using DW. After the period of incubation, 105 specimens were randomly divided into the following seven irrigation groups (G) (n = 15 per group). In G1, G2, G3 irrigation was performed with 5 mL of irrigation solution using a side-vented needle. The needle tip was placed at 12 mm and the irrigant was delivered over 2 minutes. In G4, G5, G6; Er; Cr: YSGG laser (Waterlase MD; Biolase Technology, Inc., San Clement, CA, USA) irradiation was performed with a 320-μm radial firing tip (RFT3 Endolase, Biolase Technology, Inc; calibration factor of 0.85) with panel settings of 1 W, 20 Hz (62.5 mJ), 0% water and air. The laser tip, RFT 3 was inserted 12 mm into the root canal and withdrawn at a rate of 1 mm/s with the laser activated; this procedure was repeated four times with a 15 s interval. During these intervals, root canal irrigation was performed with 1.25 mL of irrigation solution for 15 s. The total volume of irrigant was 5 mL, and the total time of treatment was 2 minutes. In G7; LAI was performed, but no irrigation solution was used. G7. LAI was performed with no solution (LAI). After treatment protocols, groups which were irrigated with NaOCl or Ca(OCl)2 were then irrigated with 3 mL 5% sodium thiosulfate for one minute to inactivate the residual effect of these irrigants, and the other groups were irrigated with 3 mL sterilized DW for one minute. For each group, all procedures were performed under aseptic conditions in a laminar flow hood with sterile gloves, sterile needles, a sterilized laser hand piece, and a sterilized RFT 3 for each sample by one investigator. After irrigation protocols of the root canals, 35 size H-file with the handle cut off was introduced to the WL with a discrete filing motion, and this H-file was transferred to a tube containing 1 mL of sterile PBS. Then 0.2 mL sterilized DW was introduced into the canal and three sterilized paper points (size 35) were placed in each canal for one minute each and then transferred to the same tube as the corresponding file. After vortexing the tube for one minute, the same culturing procedures were applied as for the initial sampling. The bacterial count was calculated in CFU/mL. The bacterial reductions were calculated from the initial and final log-transformed E. faecalis numbers and the irrigation groups were compared by using ANOVA, and post-hoc Tukey multiple comparison tests were also used for pairwise group comparisons. The performances of the irrigation within each group were evaluated by using the paired t- test for the initial and final log-transformed E. faecalis numbers. The significance level was set to P < 0.05. The mean and standard deviations (SD) of transformed data were given as the descriptive statistics. [Table 1] presents the logarithmic mean and SD of bacterial counts (CFUs/ml) of each group before and after irrigation protocols and bacterial reductions in different groups. No significant differences in initial bacterial counts between groups were found (Anova, P > 0.05). The paired t-test results of mean reductions for all intergroup comparisions were statistically significant (P < 0.05). In intragroup comparisions, in Group 1, SI + DW demonstrated poor antibacterial effects on E. faecalis (60% reduction) compared with the other treatment groups (P < 0.05). The high bactericidal reduction (99%) was observed in any of the other treatment groups: SI using NaOCl or Ca(OCl)2 and LAI with DW, NaOCl, Ca(OCl)2 or no solution, with no statistically significant difference. Several studies have examined the antibacterial effects of Er, Cr: YSGG lasers on E. faecalis during endodontic treatment in conjunction with and without NaOCl. Some of these studies have shown encouraging results,,,,, whereas others have reported questionable findings., Jha et al. demonstrated that the Er, Cr: YSGG laser was not able to eradicate an E. faecalis infection in root canals. Furthermore Eldeniz et al. showed that laser treatment reduced the viable microbial population in root canals, but it did not eradicate all bacteria, while irrigation with 3% NaOCl solution effectively sterilized all root canals. In contrast, in the present study a high degree of disinfection was achieved by using the Er, Cr: YSGG laser alone or in conjunction with and without NaOCl, Ca(OCl)2 or distilled water. Consistent with the present findings, Arnabat et al. indicated that laser irradiation was as effective as NaOCl for E. faecalis reduction. Gordon et al. demonstrated that this laser had a greater disinfectant effect than irrigation with NaOCl alone. The differences in studies may depend on several factors, such as the model of bacterial growth, incubation period of microorganisms, sampling procedures, concentration of irrigation solution, laser wavelength, pulse power, pulse duration, and use of RFT. The time that is required to growth E. faecalis ranges from 24 hours  to 50 days  in the literature. In this study, the model of bacterial growth is the one that has already been reported in previous study and 21 days incubation time has been stated to be adequate for this microorganism to invade dentinal tubules, which provides a challenge for the dispersion of antibacterial agents. For this reason, RFT3 was used in this study to facilitate entry of the emitted laser energy into the dentinal tubules in order to reach to the bacteria that have penetrated deep into the dentine. The antibacterial effect of the Er, Cr: YSGG laser is also dependent on the output power. Some researchers have demonstrated that E. faecalis recovery is decreased when laser irradiation power is increased., Licata et al. obtained lower percentage of reduction (46.1%) in teeth treated with laser at 25 mJ for 60 s. However, Wang et al. demonstrated 77% bacterial reduction on intracanal 21-day-old E. faecalis after irradiation at 1W, and a reduction of 96% after irradiation at 1.5W. In addition to differences related to output power, it has been proven that there is a positive correlation between laser irradiation duration and effectiveness in bacterial reduction., Licata et al. demonstrated that the use of a laser at 75 mJ with an irradiation time of 30 s and 60 s eliminated 92.3% and 100% of E. faecalis, respectively. Besides this, Gordon et al. found higher reduction rate (99.7%) with a 120-seconds application of laser compared to 15, 30, 60-seconds. In the current study, laser was activated 120 seconds with an 1W output power and high degree of bacterial reduction was observed. But there were no statistically significant differences between SI with NaOCl or Ca(OCl)2 compared to LAI groups in bacterial reduction of E. faecalis. In accordance with the present study, Arnabat et al. indicated that NaOCl was as effective as laser irradiation for E. faecalis reduction. Additionally, Christo et al. found no significant difference between SI using 1% NaOCl and LAI using 1% NaOCl. Although 99% reduction, complete eradication was observed in the minority of the samples. This may be attributed to the sampling procedure which were taken from the root canals after proposed treatments using H-file and paper points. This procedure would be expected to increase the detection of bacteria remaining within the dentinal tubules and other inaccessible areas. In addition to different irrigation techniques, various irrigation solutions like Ca(OCl)2, NaOCl and DW were compared with each other to eliminate E. faecalis in this study. The antimicrobial property of 2.5% Ca(OCl)2 was found to be equal to that of 2.5% NaOCl when used with SI, and this result is in line with the studies in the literature evaluating the antimicrobial potential of this solution with sonic or ultrasonic irrigation systems., Ca(OCl)2 was used in this study because of the expectation of greater antimicrobial efficacy than NaOCl. A greater quantity of hypochlorous acid is formed when it is mixed with water, and this acid is responsible for the solution's antibacterial activity by disruption of several functions of the microbial cell. 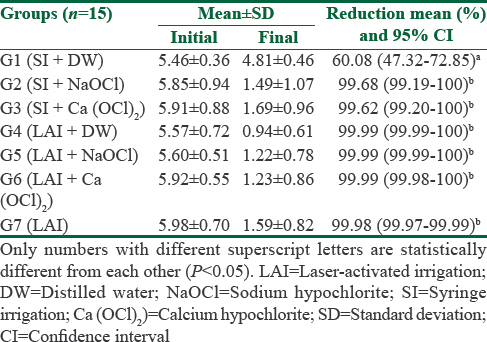 Distilled water with SI showed inferior antibacterial efficacy compared to all treatment groups since this solution is not a routine contemporary endodontic irrigant as it is not an antibacterial agent. Although using LAI alone or DW showed similar bacterial reduction ratios which were obtained with NaOCl and Ca(OCl)2 in the present study. This reduction can be explained by the destruction of microorganisms when laser energy is absorbed into their organelles and, to some degree, by the transmission of laser light within dentinal tubules, resulting in deeper penetration. The antimicrobial efficacy of higher concentration of NaOCl and Ca(OCl)2 should be tested with SI and LAI. However it has been shown that the potential for apical extrusion of NaOCl is increased with the use of laser irradiation and the size of the apical foramen. Swelling, extra-oral ecchymosis, and ulceration of the oral soft tissues have been reported following extrusion of sodium hypochlorite, but there is as yet no research regarding the cytotoxicity of Ca(OCl)2 and how it may affect the periapical tissues. Blattes et al. had analyzed in vitro cytotoxicity to cultured 3T3 fibroblasts and in vivo inflammatory reaction in rats by calcium hypochlorite (Ca(OCl)2) solutions compared with sodium hypochlorite (NaOCl) solutions. They reported Ca(OCl)2 showed favorable results of viability and induced a low-level inflammatory response in that study. Further more studies must be performed to analyze the cytotoxicity of Ca(OCl)2. The present fundings suggest that Er, Cr: YSGG laser with DW or without an irrigation solution can achieve antimicrobial activity in root canals infected with E. faecalis. As an antimicrobial agent, 2.5% Ca(OCl)2 was as effective as 2.5% NaOCl on E. faecalis with conventional or laser activated irrigation in root canals. Siqueira JF Jr., Rôças IN, Santos SR, Lima KC, Magalhães FA, de Uzeda M, et al. Efficacy of instrumentation techniques and irrigation regimens in reducing the bacterial population within root canals. J Endod 2002;28:181-4. Young GR, Parashos P, Messer HH. The principles of techniques for cleaning root canals. Aust Dent J 2007;52:S52-63. Chávez De Paz LE, Dahlén G, Molander A, Möller A, Bergenholtz G. Bacteria recovered from teeth with apical periodontitis after antimicrobial endodontic treatment. Int Endod J 2003;36:500-8. Schäfer E, Bössmann K. Antimicrobial efficacy of chlorhexidine and two calcium hydroxide formulations against Enterococcus faecalis. J Endod 2005;31:53-6. Rizoiu I, Kohanghadosh F, Kimmel AI, Eversole LR. Pulpal thermal responses to an erbium, chromium: YSGG pulsed laser hydrokinetic system. Oral Surg Oral Med Oral Pathol Oral Radiol Endod 1998;86:220-3. Silva AC, Guglielmi C, Meneguzzo DT, Aranha AC, Bombana AC, de Paula Eduardo C, et al. Analysis of permeability and morphology of root canal dentin after Er, Cr: YSGG laser irradiation. Photomed Laser Surg 2010;28:103-8. Arnabat J, Escribano C, Fenosa A, Vinuesa T, Gay-Escoda C, Berini L, et al. Bactericidal activity of erbium, chromium:yttrium-scandium-gallium-garnet laser in root canals. Lasers Med Sci 2010;25:805-10. Odor TM, Watson TF, Pitt Ford TR, McDonald F. Pattern of transmission of laser light in teeth. Int Endod J 1996;29:228-34. Gordon W, Atabakhsh VA, Meza F, Doms A, Nissan R, Rizoiu I, et al. The antimicrobial efficacy of the erbium, chromium: yttrium-scandium-gallium-garnet laser with radial emitting tips on root canal dentin walls infected with Enterococcus faecalis. J Am Dent Assoc 2007;138:992-1002. Dewsnup N, Pileggi R, Haddix J, Nair U, Walker C, Varella CH, et al. Comparison of bacterial reduction in straight and curved canals using erbium, chromium:yttrium-scandium-gallium-garnet laser treatment versus a traditional irrigation technique with sodium hypochlorite. J Endod 2010;36:725-8. Siqueira JF Jr., Batista MM, Fraga RC, de Uzeda M. Antibacterial effects of endodontic irrigants on black-pigmented gram-negative anaerobes and facultative bacteria. J Endod 1998;24:414-6. Christo JE, Zilm PS, Sullivan T, Cathro PR. Efficacy of low concentrations of sodium hypochlorite and low-powered Er, Cr: YSGG laser activated irrigation against an Enterococcus faecalis biofilm. Int Endod J 2016;49:279-86. Wang QQ, Zhang CF, Yin XZ. Evaluation of the bactericidal effect of Er, Cr: YSGG, and nd: YAG lasers in experimentally infected root canals. J Endod 2007;33:830-2. Wang X, Cheng X, Liu X, Wang Z, Wang J, Guo C, et al. Bactericidal effect of various laser irradiation systems on Enterococcus faecalis biofilms in dentinal tubules: A Confocal laser scanning microscopy study. Photomed Laser Surg 2018;36:472-9. Tanomaru-Filho M, Leanardo MR, Silva LA, Annibal FF, Faccioli LH. Inflammatory response to different endodontic irrigating solutions. Int Endod J 2012;38:1395-8. Whittaker HA, Mohler BM. The sterılızatıon of mılk bottles wıth calcıum hypochlorıte. Am J Public Health (N Y) 1912;2:282-7.
de Almeida AP, Souza MA, Miyagaki DC, Dal Bello Y, Cecchin D, Farina AP, et al. Comparative evaluation of calcium hypochlorite and sodium hypochlorite associated with passive ultrasonic irrigation on antimicrobial activity of a root canal system infected with Enterococcus faecalis: An in vitro study. J Endod 2014;40:1953-7. Dumani A, Guvenmez HK, Yilmaz S, Yoldas O, Kurklu ZG. Antibacterial efficacy of calcium hypochlorite with vibringe sonic irrigation system on Enterococcus faecalis: An in vitro study. Biomed Res Int 2016;2016:8076131. Dutta A, Saunders WP. Comparative evaluation of calcium hypochlorite and sodium hypochlorite on soft-tissue dissolution. J Endod 2012;38:1395-8. Görduysus M, Küçükkaya S, Bayramgil NP, Görduysus MÖ. Evaluation of the effects of two novel irrigants on intraradicular dentine erosion, debris and smear layer removal. Restor Dent Endod 2015;40:216-22. Jha D, Guerrero A, Ngo T, Helfer A, Hasselgren G. Inability of laser and rotary instrumentation to eliminate root canal infection. J Am Dent Assoc 2006;137:67-70. Eldeniz AU, Ozer F, Hadimli HH, Erganis O. Bactericidal efficacy of Er, Cr: YSGG laser irradiation against Enterococcus faecalis compared with NaOCl irrigation: An ex vivo pilot study. Int Endod J 2007;40:112-9. Chávez de Paz LE, Bergenholtz G, Svensäter G. The effects of antimicrobials on endodontic biofilm bacteria. J Endod 2010;36:70-7. Gründling GL, Zechin JG, Jardim WM, de Oliveira SD, de Figueiredo JA. Effect of ultrasonics on Enterococcus faecalis biofilm in a bovine tooth model. J Endod 2011;37:1128-33. Harrison AJ, Chivatxaranukul P, Parashos P, Messer HH. The effect of ultrasonically activated irrigation on reduction of Enterococcus faecalis in experimentally infected root canals. Int Endod J 2010;43:968-77. Licata ME, Albanese A, Campisi G, Geraci DM, Russo R, Gallina G, et al. Effectiveness of a new method of disinfecting the root canal, using Er, Cr: YSGG laser to kill Enterococcus faecalis in an infected tooth model. Lasers Med Sci 2015;30:707-12. Franzen R, Esteves-Oliveira M, Meister J, Wallerang A, Vanweersch L, Lampert F, et al. Decontamination of deep dentin by means of erbium, chromium: yttrium-scandium-gallium-garnet laser irradiation. Lasers Med Sci 2009;24:75-80. George R, Walsh LJ. Apical extrusion of root canal irrigants when using er: YAG and Er, Cr: YSGG lasers with optical fibers: An in vitro dye study. J Endod 2008;34:706-8. Hülsmann M, Hahn W. Complications during root canal irrigation – Literature review and case reports. Int Endod J 2000;33:186-93. Blattes GB, Mestieri LB, Böttcher DE, Fossati AC, Montagner F, Grecca FS, et al. Cell migration, viability and tissue reaction of calcium hypochlorite based-solutions irrigants: An in vitro and in vivo study. Arch Oral Biol 2017;73:34-9.